GENEVA, Ill. - The Kane County Cougars have announced the launch of the organization's specialty branded coffee appropriately named "7th Inning Blend". In partnership with Two Brothers Coffee Roasters, who created the blend, the Cougars are creating Minor League Baseball history by becoming the first Minor League team with their own coffee and beer. Two Brothers Brewing also produces the Cougars-branded beer, Raging Cougar Ale. Two Brothers Coffee Roasters assembled a winning blend of coffees from Central and South America. The dark chocolate and brown sugar flavors combine for a sweetness that's sure to be a home run for Cougars fans. 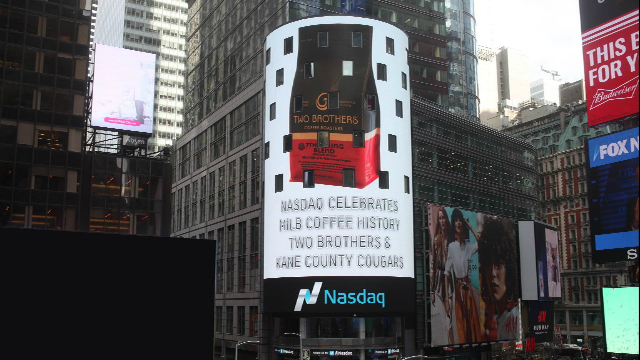 "We're excited for Two Brothers Coffee Roasters 7th Inning Blend to be the official coffee of the Kane County Cougars," said co-founder of Two Brother's Brewing Company, Jason Ebel. "We are happy to offer a premium product that people who are fans of both Two Brothers and the Cougars can enjoy this summer." 7th Inning Blend will be sold at concession stands during Kane County Cougars home games and will also be available for purchase by the bag in the DeVry University Cougars Den Team Store. Fans who purchase a bag can redeem the empty 7th Inning Blend wrapper at the Cougars box office for a pair of undated tickets valid during the 2016 regular season. The Cougars were recently featured on the high-tech electronic display that wraps around the NASDAQ building in Times Square to celebrate the official launch of 7th Inning Blend. This is the second time the Cougars have been featured on the famous MarketSite Tower. Last season, a special message promoting the organization's 25th anniversary campaign was displayed on the iconic building which illuminates Times Square 24 hours a day providing the latest financial news, market highlights and advertisements. "The launch of 7th Inning Blend is further proof of the wonderful partnership that the Cougars organization shares with Two Brothers Brewing and Coffee Roasters," said Cougars owner, Dr. Bob Froehlich. "We are looking forward to seeing the fans excitement throughout the season as they enjoy the new Cougars-branded coffee at the ballpark." The Cougars' specialty beer, Raging-Cougar Ale, will be available on tap again this season at Fifth Third Bank Ballpark. Launched in 2015, Raging-Cougar Ale is described as a light and hoppy pale ale with a nutty caramel flavor. Fans helped to select the name through a special beer-naming campaign held on the Cougars social media channels. "Not only can fans enjoy 7th Inning Blend at the Ballpark, but they can also brew it at home," said Cougars owner, Cheryl Froehlich. "As an organization, we are always looking to enhance our fan experience and this is another avenue that we're excited to provide for them." The Cougars opened their 2016 season on Thursday, April 7 against the Clinton LumberKings. This season fans will be treated to Chicagoland's best family-friendly promotions including theme nights, fireworks shows, weekly specials, pre-game concerts and more. For more information about the Kane County Cougars, visit kccougars.com. Fans are encouraged to follow the Cougars on social media for updates throughout the season on tickets and special promotions.